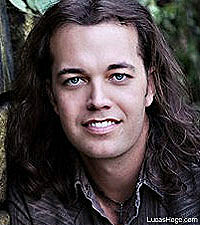 Country artist Lucas Hoge is set to make his national TV debut on Animal Planet's new reality show 'Last Chance Highway.' The eight-part series focuses on the monumental mission of a dedicated handful of animal rescuers. Each week, they organize a band of volunteers to take part in a unique mobile adoption campaign in an effort to find homes for strays and unclaimed shelter dogs. Lucas provides entertainment and companionship to cast member Kyle Peterson as they climb aboard Animal Planet's big rig to transport more than 150 dogs thousands of miles to meet their new families. "It's an exhausting ritual but one that finds homes for more than 6,000 pets every year," says Lucas. "For me to be able to contribute to even a fraction of that number is greater in its true sense, than any number of miles I'll ever drive." The show premieres on the Animal Planet channel on June 19 at 8:00 PM ET. Lucas will be participating in the CMA Music Fest before joining his cast members for a national media blitz in support of the series. The Nebraska native wrote the theme song for the new show, which is produced by Al Roker Entertainment.